With the forced update I mentioned in the previous Minecraft post, our world settled down to something akin to normalcy. 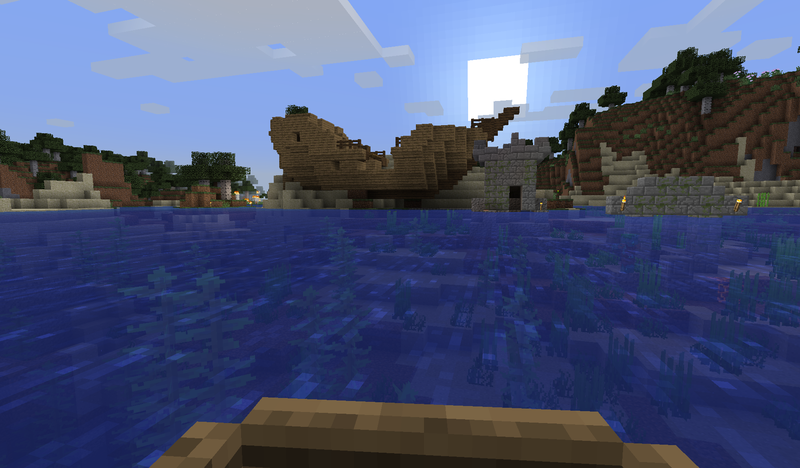 Minecraft Realms still seems to be struggling some to handle the load that has come with the Aquatic Update. It takes some time to log into the server and there are times when chunks are slow to load and responsiveness is lacking. But for the most part things work. Technical problems solved… mostly… now to get to the real problem, finding the new stuff! But to get the new stuff you have to go find the new stuff. Some of it will spawn anywhere. I’ve seen the new fish and dolphins swimming around in every bit of water. But most of it… kelp and ship wrecks and coral and that stuff… will only show up when a chunk or region is first generated. So basically any place we had already been on the map wasn’t going to have any of the new sea life features in full. It was time to go exploring. And I had a goal in mind. I wanted to see the coral and tropical fish. For that I needed a warm ocean. 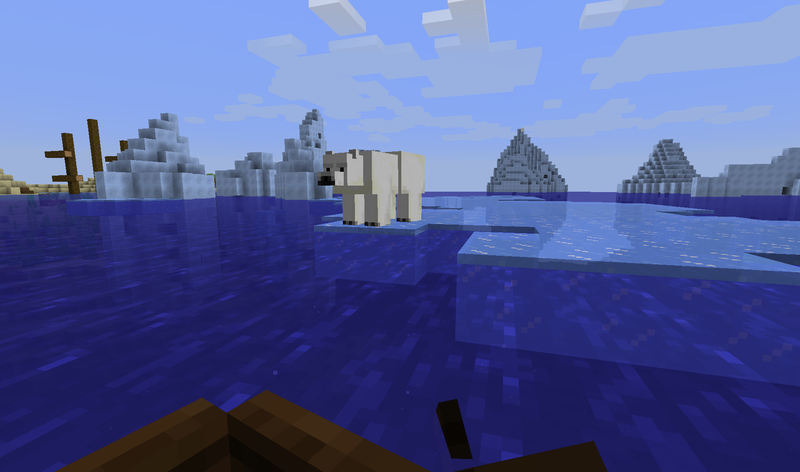 I had found a cold ocean already, with ice floes and polar bears. I had even rowed through a lukewarm ocean, which has some of the fish from a warm ocean, but still just kelp and such on the seabed. But a warm ocean wasn’t so close to hand. So I packed my bag with some supplies, repaired all my equipment, and set out on a boat to find a warm ocean. At first I spent a bit of time just finding an ocean, or at least an ocean that hadn’t been explored already. I even found some things I did not expect. But dragging out the map of the our world gave me some hints, places where I might explore. I had a couple of false starts, heading towards where I felt there ought to be fresh, uncharted ocean, only to find myself walking for ages or sailing up and down rivers and into more cold oceans. I was also operating under a bit of a faulty assumption, that biomes followed some sort of logic. I mean, they do in that they interconnect and transition smoothly. But I was thinking that you might find warm water near a desert or a savanna biome. That was asking too much. At one point I set up camp in a desert temple right on the edge of an ocean… a cold ocean. I could site there in the sand on the beach and see polar bears. Biome logic right there I guess. So I started googling about finding warm oceans and, frankly, the results just confirmed what I already knew. 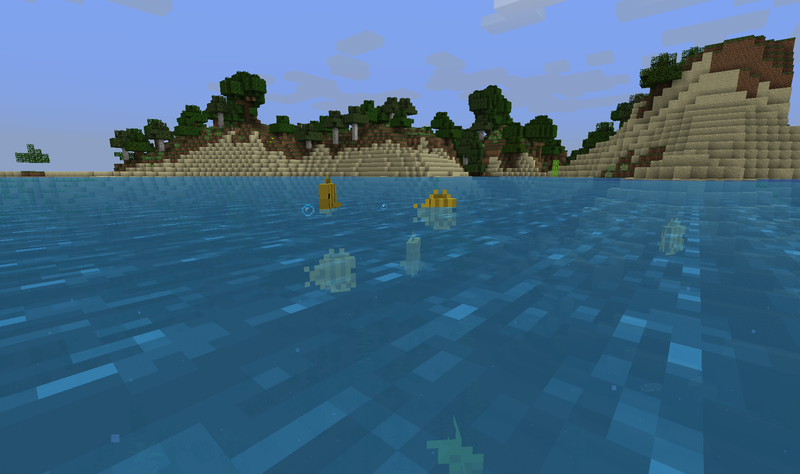 There was not yet an automatic way to find the new ocean biomes yet. So I set myself to the task of just finding a lot of ocean. For that there are a number of biome finders out in the world where you can enter the seed value for your world (ours is 7911042834612981993) and it will give you the approximate layout of biomes. None of these tools are updated for 1.13, so none of them will point out a warm ocean biome for you, but they will show you where oceans are at least, at least if you can figure out where to look. Yes, they give you the X,Z coordinates, but I am used to the landmarks we’ve built on our world to help guide me. Still, there was a spot way up the rail line to the northern forest mansion near one of the bases I setup along the way… a base with a nether portal no less, so I could use the nether transport system to get there more quickly… where if I started heading straight west I would run into a lot of as-yet un-rendered land and, eventually a wide expanse of water. So I headed up there and started walking. I tried to keep to a very straight line, marking my path and burning down the occasional batch of trees that would otherwise make me turn aside. Once I start meandering in all directions I end up lost pretty quick. The landscape is pretty but not very distinctive, and when the sun is at its zenith I can end up heading the wrong way pretty quickly. 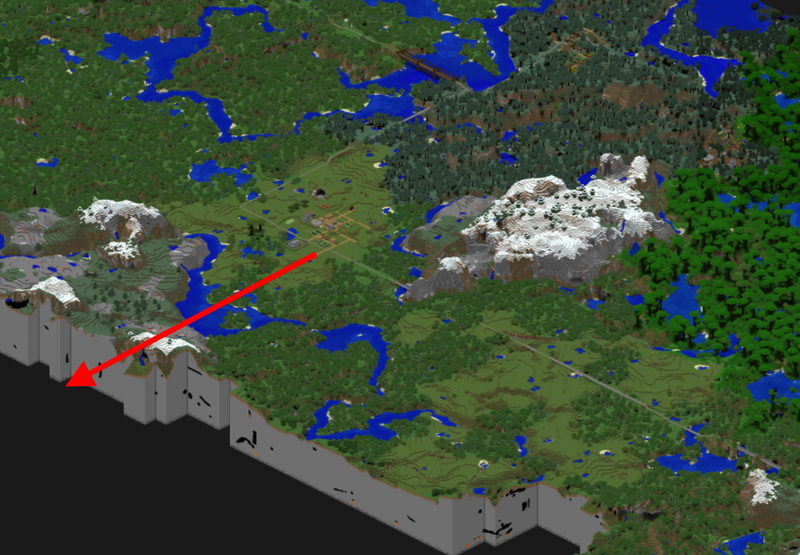 I had, of course, just eyeballed the distance on the biome finder, and it always takes longer to get anywhere that you think. I had thought about taking a horse, but keeping it safe during the night is always a bit of a challenge, and the goal was to get to an ocean where I would be rowing all the time, so I kept to just my feet. I was slowed up a bit because I ran into several villages along the way. That is because I have this need to “fix” such villages as I pass through. When a Minecraft village is generated, it is just layered over whatever terrain there is. If you’re out in the plains, everything is generally fine. If there are hills however, you can end up with some strange building placement. So I have to stop and dig out the buried buildings, build up the paths to reach the buildings up in the air, build a supply rest stop with bed, chest, and workbench, and light the place up. I had to stop and dig for coal a couple of times, since I used up all my torches lighting up yet another village. Despite this I did eventually make my way to a coast and a wide expanse of water. It was time to get in my boat and start rowing to see if I could find a warm ocean. I was a bit worried that maybe somebody had been here before despite the area not having been part of my most recent map render. When I pressed F3 it said that the biome was simply an “ocean,” neither warm nor cold, and it led into a “deep ocean,” again without a temperature modifier in the name. I persisted though, and found a lukewarm ocean after not too long, so it seems that an “ocean” is somewhere between warm and cold. It makes sense I guess. So I kept rowing. I found lots of things. I saw several wrecks and undersea ruins, including a combo wreck and ruin that were on the shore. 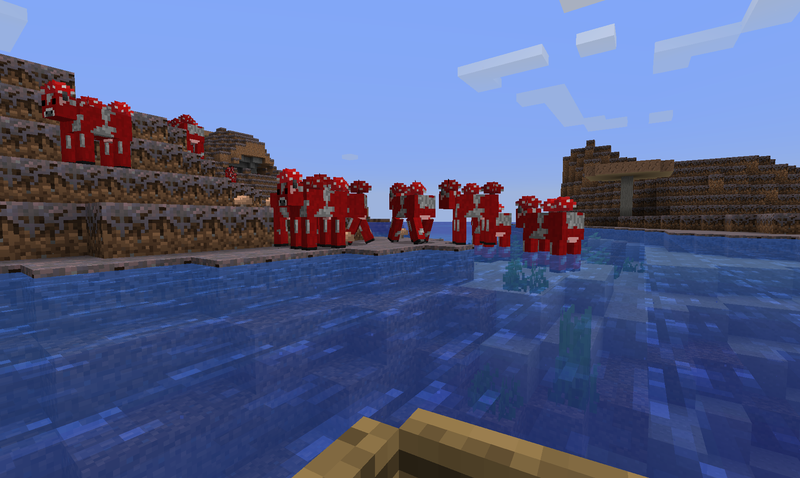 I also found one of the rare mushroom islands, complete with the mushroom cows that inhabit such places. I was not, however, any close to finding a warm ocean so far as I could tell. 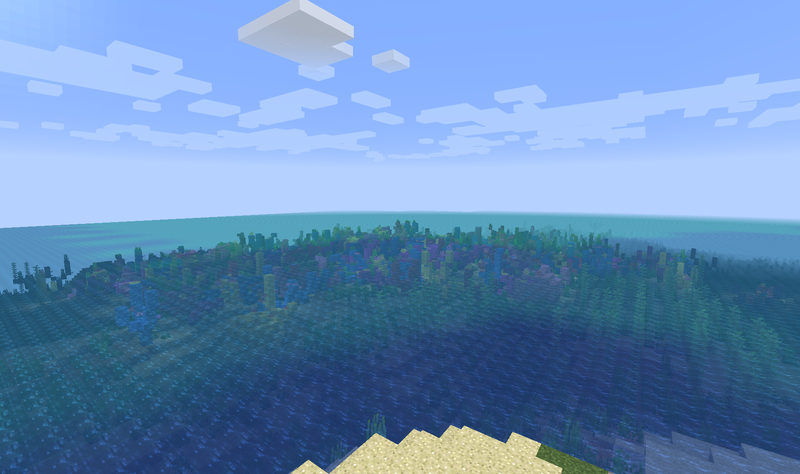 It became clear to me that this large ocean area was made up of many different ocean biomes, so it seemed likely that there was a warm ocean out there. But spotting such a biome from a distance might be tricky, which would mean zig-zagging all over the water to make sure I hit every biome. There was a hint. One of the changes that went in with the aquatic update was the color of water. Rather than being one uniform color, water now has different colors. Cold and normal oceans are the deep blue to which we have become accustomed. Water in swamps now has a sickly greenish tint that is just about perfect. And warm water has a lighter aquamarine shade, which stands out even at a distance. Unfortunately, that shade applies to both warm and lukewarm water, so I spent time chasing lighter shades of blue only to be disappointed. Still, I kept going. There was a lot of ocean to row around so I kept going, day or night. Exploring at night seemed a bit wrong, since you cannot differentiate the water color in the dark. But I would just hit F3 every so often to get a reading on which biome I was in to cover that. Of course, it turned out that exploring at night was just the ticket. As I rowed along during one night cycle I saw some light under the water. This wasn’t a big deal at first. 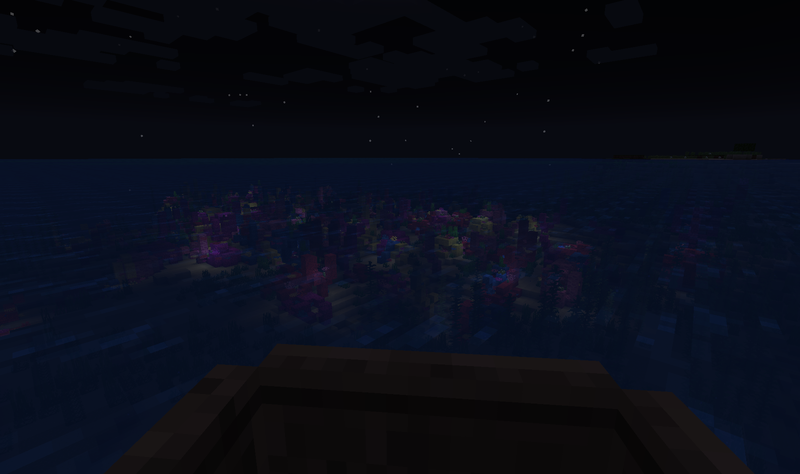 Underwater ruins have sea lanterns in them, so you can spot them from quite a ways away at night. But as I got closer this seemed like a lot more light than just one ruin, so I steered towards it and soon found I had reached my goal. It is hard to see in that screen shot, especially against the white background of the blog, but that is a bed of the new coral, all aglow under the water. I had reached my warm ocean at last. As it turns out, sea pickles… which I guess is what you get if you put a sea cucumber in brine… give off light. They also only appear in warm oceans, so a decent way to find a warm ocean is to row about at night looking for light under the water. This turned out to be just the corner in what was a long stretch of warm ocean. I sailed along, looking for some land nearby where I could setup a base. I did find a stretch of likely soil after a bit, and when the sun came up I went ashore and built a little house with the usual amenities . From the shore there I could look out and see the beds of colorful coral. So I found my warm ocean, which led me to the usual question, “Now what?” I didn’t have a plan for the warm ocean really, aside from finding it. Meanwhile I was also now at least a good 5km from the nearest settled area, though I had wandered about so much I wasn’t really sure. I was also low on some supplies and, more importantly, my tools and weapons were fast wearing out after fighting many zombies and fixing one village after another. I felt that, having now located a warm ocean I needed to head back to one of my established supply bases to repair and re-pack. Fortunately I knew that I didn’t need to trace my exact steps home. (I couldn’t manage that if I had wanted.) I knew I was still south of the northern forest mansion, so all I had to do is travel straight east and I would eventually cross the long overland rail line that connects the mansion to the rest of our settlements. So the next step was to sail eastward, but that is a topic for another post. 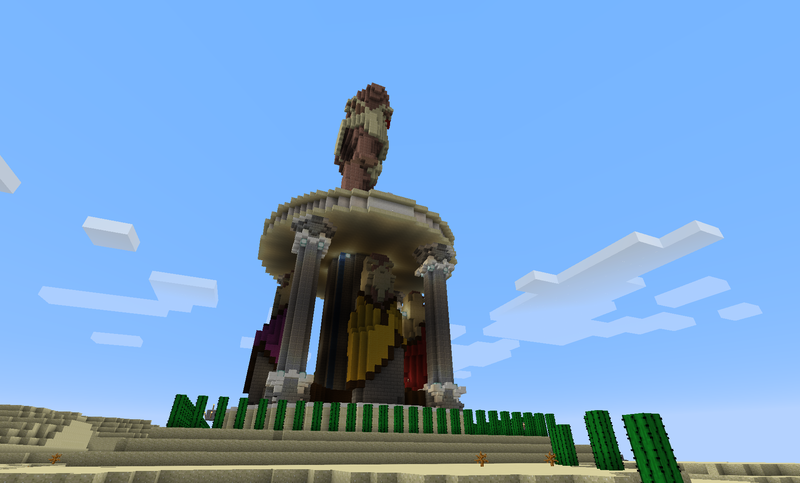 This entry was posted in entertainment, Minecraft and tagged Aquatic Update on July 30, 2018 by Wilhelm Arcturus. Honestly, this was the series of posts that led me to your site. Good to see interest hasn’t died off in this direction. I look forward to the rest.